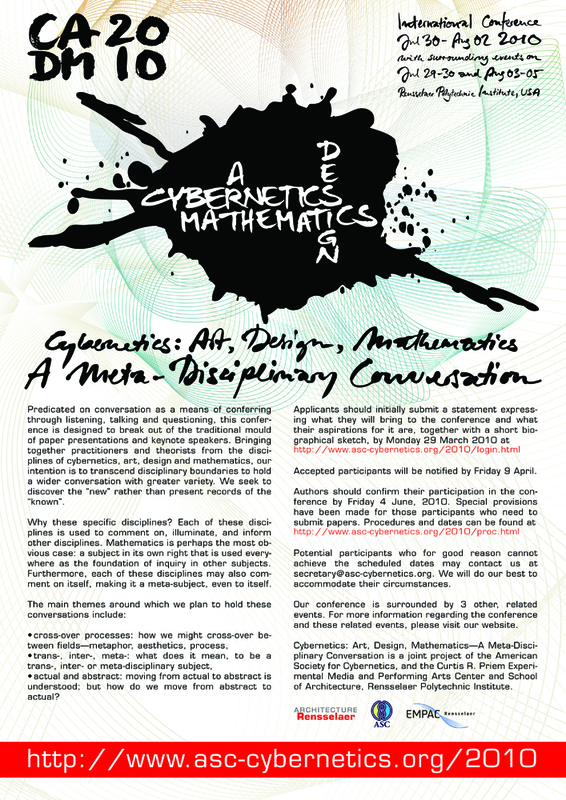 “Cybernetics: Art, Design, Mathematics — A Meta-Disciplinary Conversation” is a conference where the main business will be to confer—to explore ideas through discussion and open exchange, in other words, to take part in an enormous brainstorm together! It is concerned with forming and asking the next question rather than reporting on answers to the last question. The conference is constructed around exploring and developing analogies between our four areas—cybernetics, the arts (including music), design and mathematics. Cross-overs between pairs of these subjects have been common, yet the nature of these cross-overs has rarely been examined, nor have all 4 subjects previously been brought together. We invite those interested in this approach to apply to participate in the conference. Potential participants should create statements of interest indicating what they feel they bring to the conference and what their aspirations are for their participation, together with a short biographical sketch. These will be used as the basis for issuing invitation to join us. To apply, please create an account for yourself by following this link, and then log in here to state your interest, as described in greater detail here. Understanding the practicalities of conference attendance, we will accommodate (refereed) papers and will publish proceedings. However, we stress that the central concern of the conference is the communal development of understandings and ideas: we are looking for participants who listen and converse, rather than those who wish to present papers in a traditional manner. To this end, we have designed a particular (and novel) process for paper refereeing and presentation (see Papers and Publications and subtopics). actual and abstract: moving from actual to abstract is understood; but how do we move from abstract to actual? What are the relations between models that are conceptual, computational and physical? How are their differences productive? Evenings will be left free during the conference for improvisation, performance and demonstration; and for impromptu workshops. Formal paper presentations may also take place in the evening. 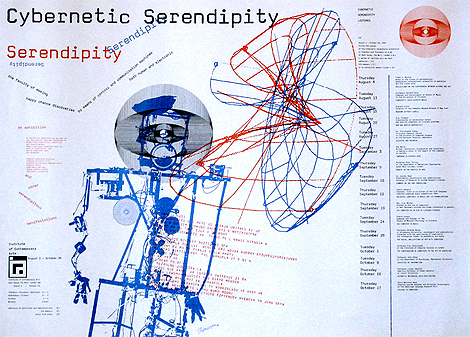 Before the conference, we will offer tutorials on how cybernetics has developed over the past 40 years (since the Cybernetic Serendipity exhibition of 1968). After the conference, a small, invited group will work on forming the outcomes and discoveries of the brainstorming of the main conference into a coherent set of outcomes. We have collected a wonderful International Advisory Panel, who lend their support to the conference and help us guide its development. The conference is organized by the American Society for Cybernetics, in collaboration with the School of Architecture, and the The Curtis R. Priem Experimental Media & Performance Arts Center of Rensselaer Polytechnic Institute. The public conference will take place starting with an evening event on 30 July and ending in the evening of 2 August, 2010.